Folder Lock 7.7.6is great security app that lets you password-protect files, folders and drives; encrypt your important files on-the-fly, backup files in real-time, protect portable drives, shred files & drives and clean history. Folder Lock can password-protect, lock, hide and encrypt any number of files, folders, drives, pictures and documents in a matter of seconds. The protected files are hidden, cannot be deleted and are also inaccessible and highly secure. It can hides files from kids, friends and co-workers, and safeguards them from viruses, Trojans, worms and spyware it can even protect them from networked PCs or cable users and hackers. Files can also be protected on USB Flash Drives Memory Sticks, CD-RW, floppies and notebooks. Protection works even if files are moved from one PC to another on a removable disk, without the need to install any software. Folder Lock locks files in Windows, DOS and even Safe Modes. Folder Lock is well built, flexible application that offers more than just locking down folders. You also have the option to create virtual encrypted Wallets, for storing data such as addresses and bank information. You can also back up all of your encrypted data to the cloud. Folder Lock’s configuration settings are comprehensive and password protected for extra security. 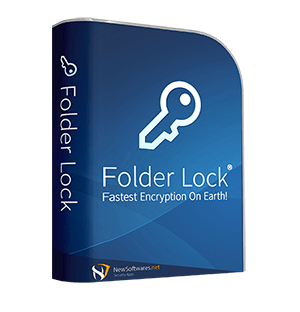 Folder Lock 7.7.6 also comes with some additional options including Stealth Mode, Hacker Attempt Monitoring, Shred files, Auto Lock, Auto Shutdown PC, Lock your PC, Erase PC tracks, 256-bit Blowfish Encryption and Context Menu in Explorer. Folder Lock is an excellent folder protection application that has Windows Explorer integration, Loads of lockable options and a wallet feature. It also comes with some good extras such as the backup and shred tools. Overall, Folder Lock is just what you need to secure your data in a simple, albeit ugly, interface. Folder Lock 7.7.6 lets you password-protect files, folders and drives; encrypt your important files on-the-fly; backup them in real-time; protect portable drives; shred files & drives and clean history. It is the most downloaded file-security application with more than 45 million users. It works on 32-bit and 64-bit Windows 10, 8, 7, Vista, XP. Keep your encrypted lockers backed up and synced on a dedicated secure cloud server. Furthermore, if you want to protect your files without encrypting them, you can also lock your files, folders and drives on your PC from access and visibility. You can also create Encrypted Wallets to save personal information like Credit Cards, Bank Accounts and Business Cards. You can also Shred files, folders, drives and empty hard drive space. You can also clean Windows usage history. Additionally, Folder Lock comes with additional security settings unheard before. You can activate password security and restrict access to different parts of the application using an admin level master password. You can run the application in complete stealth using the Stealth Mode feature. You can also catch and perform actions on repetitive hack attempts and on basis of incorrect password logs and you can set automatic duration based protection for your data security, so you know that your stuff is no longer accessible to anyone else when you’re away from your PC. Folder Lock can Lock and Hide files and folders within seconds. It enables you to Password Protect and restricts the unwanted eyes from viewing files, folders and drives. Once you’ve locked a folder, it will be hidden from its previous location and can only be accessed through the software interface. Folder Lock creates Lockers. Just as you would put your money in a safe, would you like to keep your files in a digital ‘Locker’ that’s safer than a bank’s vault? You can create ‘Locker(s)’ which are protected by AES 256-bit encryption. You need not encrypt or decrypt files when accessing; simply copy them to Locker and voila! They are encrypted on-the-fly. How To Install Folder Lock 7.7.6? Download Folder Lock 7.7.6 from below.